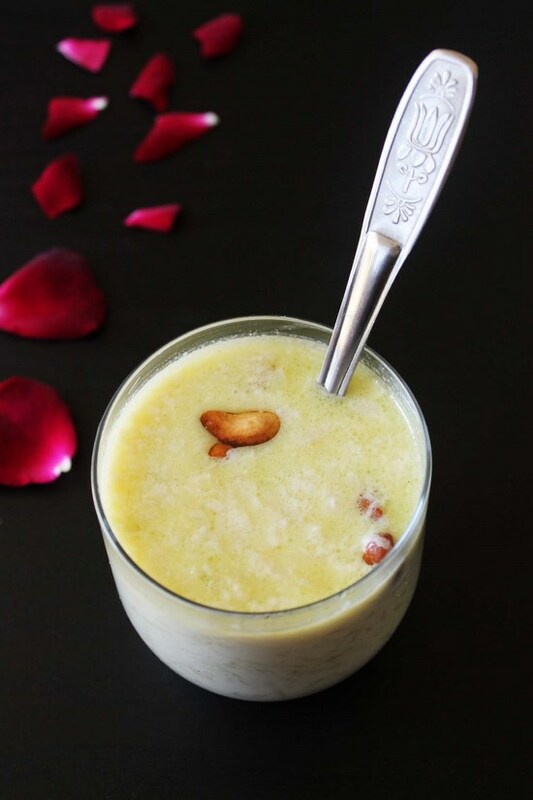 Lauki ki kheer recipe or dudhi kheer – an Indian dessert made from bottle gourd vegetable. It is like the sweet pudding. As navratri is going on, many people keep the fasting during these nine days. So I thought of sharing a sweet recipe for vrat. When it comes to the vrat or fast, we do not eat bottle gourd. But many family do consume this vegetable especially in Northern side of India. if you are not aware of your family tradition, I would highly recommend please consult with your elders before making. Earlier I have shared the lauki halwa recipe. It is our family favorite. So this time I am making kheer using this vegetable. The method of making lauki ki kheer is similar to any other kheer recipe. It is simple and easy to make. 1) Wash the lauki, peel it. Cut into the half. Remove the seeds. And grate it using grater (use bigger sized hole). 2) Squeeze out all the water by pressing it between your palms. 3) Now heat the ghee in a pan on medium heat. Once hot fry the cashews till they are lightly browned. drain and remove them into another bowl, keep it aside. 4) Now add grated lauki into the same pan. Sauté it till all the moisture from the lauki evaporates and also lauki will get cooked. Stir in between. 5) While lauki is cooking, heat the milk in a heavy bottom pan on another stove on medium heat. Let it come to a boil. 6) Now back to the the Lauki. As it gets cooked, it will shrink and there is no moisture. it will take about 7-8 minutes. Turn off the stove and keep it aside till needed. Also keep an eye on milk. 7) Once milk comes to a boil, do stir it every 2 minutes and also scrape the sides of the pan. This will help to clean the pan easily later on. 8) keep simmering the milk till it reduces slightly. we started with 2 cups, boil till it is about 1 ½ cups. 9) Then add cooked bottle gourd. 10) Mix it and cook for about 4 minutes. by this time milk will get thick. 12) Mix it. Kheer will become again thinner as sugar melts. Cook it with stirring in between till it thickens again (about 2-3 minutes). Turn off the stove. How to check that kheer is ready? When you take kheer in a spoon and you pour it back, thickened milk and lauki should drop together. If milk and lauki looks separated then let it thicken more. 13) Finally add cardamom powder and rose water. Mix it. 14) Garnish with fried cashews. Let the kheer become warm and then it is ready to serve. 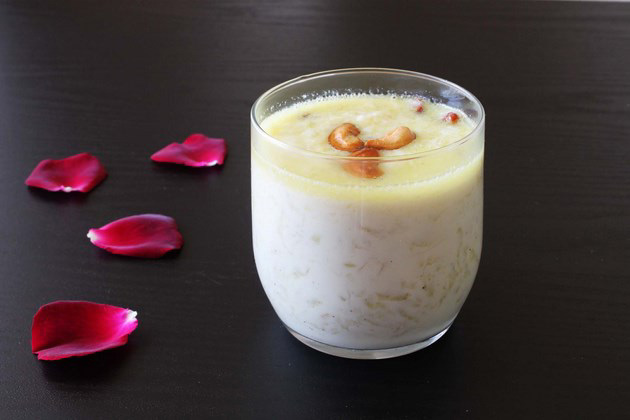 If you prefer the chilled kheer then let it come to room temperature then chill in the fridge for couple of hours. Then serve. Serving suggestion: Serve as a dessert after or along with the meal. This is perfect sweet to eat while you are on fast like Navratri vrat fasting, Ekadasi Fasting. 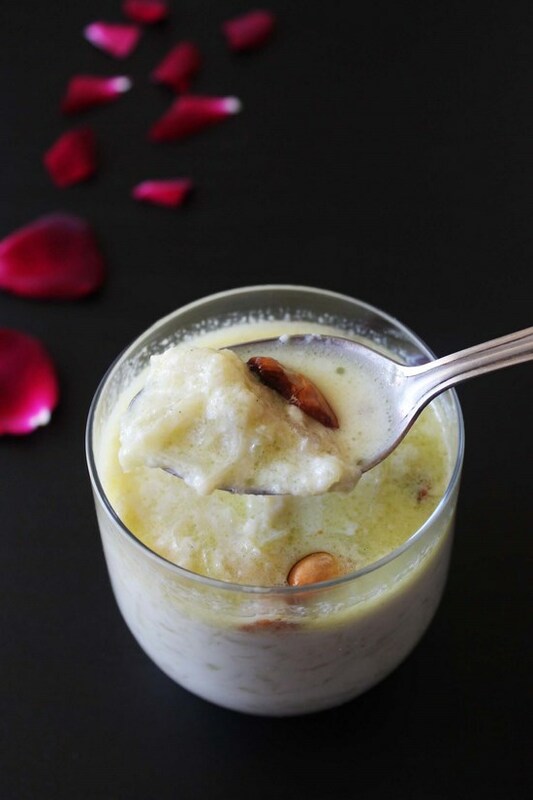 Lauki ki kheer recipe or dudhi kheer - an Indian dessert made from bottle gourd vegetable. It is like the sweet pudding. Wash the lauki, peel it. Cut into the half. Remove the seeds. And grate it using grater (use bigger sized hole). Squeeze out all the water by pressing it between your palms. Now heat the ghee in a pan on medium heat. Once hot fry the cashews till they are lightly browned. drain and remove them into another bowl, keep it aside. Now add grated lauki into the same pan. Sauté it till all the moisture from the lauki evaporates and also lauki will get cooked. Stir in between. While lauki is cooking, heat the milk in a heavy bottom pan on another stove on medium heat. Let it come to a boil. Now back to the the Lauki. As it gets cooked, it will shrink and there is no moisture. it will take about 7-8 minutes. Turn off the stove and keep it aside till needed. Also keep an eye on milk. Once milk comes to a boil, do stir it every 2 minutes and also scrape the sides of the pan. keep simmering the milk till it reduces slightly. we started with 2 cups, boil till it is about 1 ½ cups. Then add cooked bottle gourd. Mix it and cook for about 4 minutes. by this time milk will get thick. Then add sugar. Mix it. Cook it with stirring in between till it thickens again (about 2-3 minutes). Turn off the stove. How to check that kheer is ready? When you take kheer in a spoon and you pour it back, thickened milk and lauki should drop together. If milk and lauki looks separated then let it thicken more. Finally add cardamom powder and rose water. Mix it. I prepared this kheer. It is delicious! Tasted great when refrigerated! 🙂 Thanks! good to hear. Even I also like chilled one.